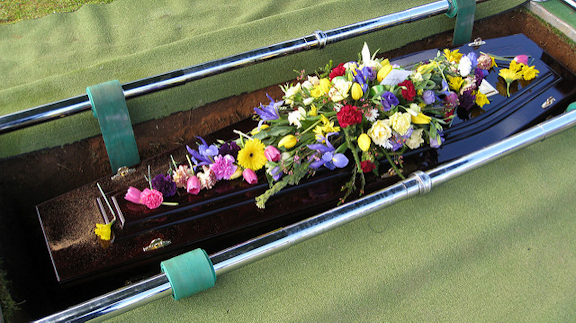 Last month I dreamed about a coffin, as I blogged about here. I thought the dream probably meant I had something in my subconscious that needed to get buried. But, what might it be, and how to go about it? Then I decided that I really didn’t have to be so exact about finding one particular issue from the past. After all, everybody has lots of failed expectations wandering around in the dark depths of the subconscious. Giving myself permission to lay them to rest, generally, ought to be good enough. So I put together an imaginary funeral service for the poor tragic character, Ms. Failed Expectations, burying her in the coffin from my dream in a beautiful but never-worn party dress. My various younger selves were in attendance as the mourners, bringing lovely bouquets and recalling their memories of the dearly departed. It was a dark and stormy afternoon straight out of a bad novel. No rain had started to fall yet, but lightning flashed all around. The air smelled of ozone and melodrama. The casket, piled high with bright flowers, rested beside the open grave. The gravediggers slowly lowered the casket into place and began shoveling the dirt over the bright flowers, while my grieving past selves wailed and a cold rain began to fall. OH Meg, this is really good! I remember that dream and I was thinking the same about something in your subconscious. You turned it into a meaningful post, great job!